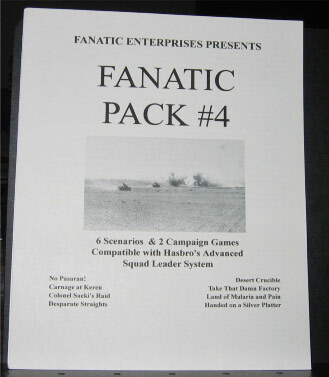 The ever prolific Paul Kenny released his fourth Fanatic Pack in the summer of 2006. This effort was different from previous scenario packs in several ways. First, it is in color–not just flags but counters as well. Second, it actually has counter artwork instead of simply putting numbers on the counters. This represents a nice improvement in physical quality (although it should be noted that the editing and proofreading is as poor as ever; one of the scenarios is even misspelled on the cover page). 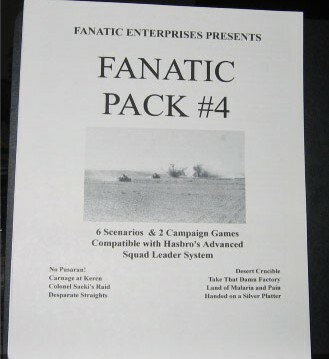 And lastly, it has fewer scenarios, but does include two Platoon Leader campaign games for people who like that system. The six scenarios, as usual, represent an interesting range of actions: Eritrea 1941, Thailand 1941, Hong Kong 1941, Stalingrad 1942, Burma 1943, and Hungary 1945. Two of them, FE128 (Carnage at Keren) and FE133 (Handed on a Silver Platter), use the geomorphic mapboards found in Heat of Battle’s High Ground!. There are two small-medium scenarios and four large scenarios (although one or two of these look like they might play relatively quickly). Two scenario has OBA, one has cavalry, and a third allows the purchase of fortifications. Two of the scenarios, FE129 (Colonel Saeki’s Raid) and FE130 (Desperate Straights) would both make good tournament scenarios. FE129 is a fun scenario, but getting the errata for it is very important. The scenario is essentially unplayable without the errata, which illustrates the generally poor quality control, as some things should have been caught during the very first playtest. Both the campaign games feature interesting conflicts. FE CG1 (¡No Pasaran!) simulates part of the crucial battle for Madrid during the Spanish Civil War in 1936. 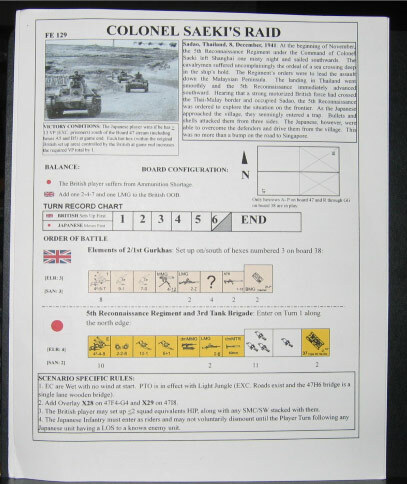 FE CG2 (Desert Crucible) portrays part of the battle of El Alamein in October 1942. Neither scenarios nor campaign games have been played very much. By this time, the poor reputation of Fanatic Enterprises for quality control was beginning to catch up to it.